When you think about a perfect Christmas, what do you dream about? Is it that dream of a white Christmas? Not the dusting of snow we may occasionally get, but properly thick, crunchy, white snow layered on the ground and piled up on rooftops and tree branches. Well that’s exactly what we had this year when we had Christmas in Lapland with the amazing company Santa’s Lapland. 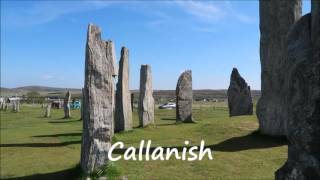 We flew out from Glasgow airport on Christmas Eve and after enjoying a lot of festive cheer and songs aboard the plane we arrived at the tiny airport of Ivalo, Finland, inside the Arctic circle. It was quite mild on our arrival, only -3, but definitely cold enough for a few layers! Once we found our bags and were directed outside to our transport to the hotel, we met a gorgeous young reindeer. Our boys weren’t too sure about getting close to it (I call it a survival instinct! ), but plenty of other kids were happy to have their photographs taken beside the beautiful animal and it’s Sami handler. 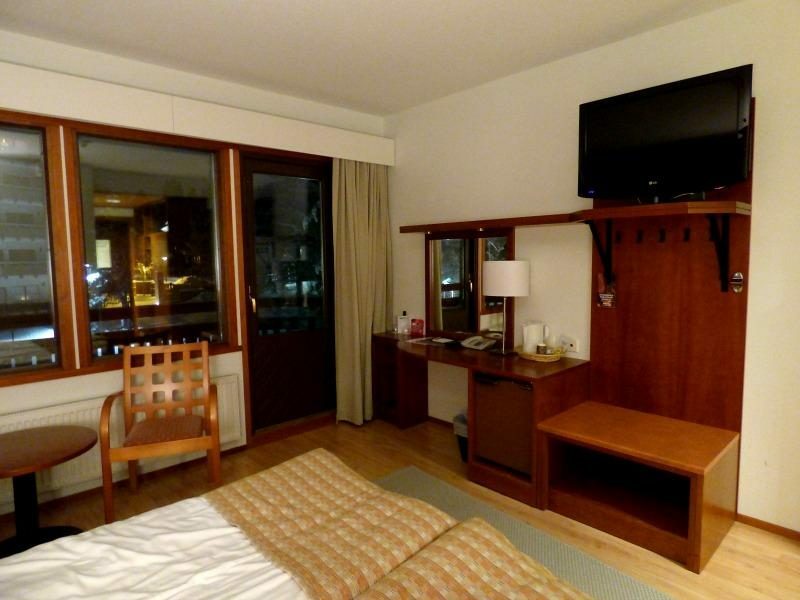 On arrival at our hotel, Hotel Riekolinna in Saariselka, we were shown to our ‘family apartment’, which is a set of two adjoining rooms for the four of us. 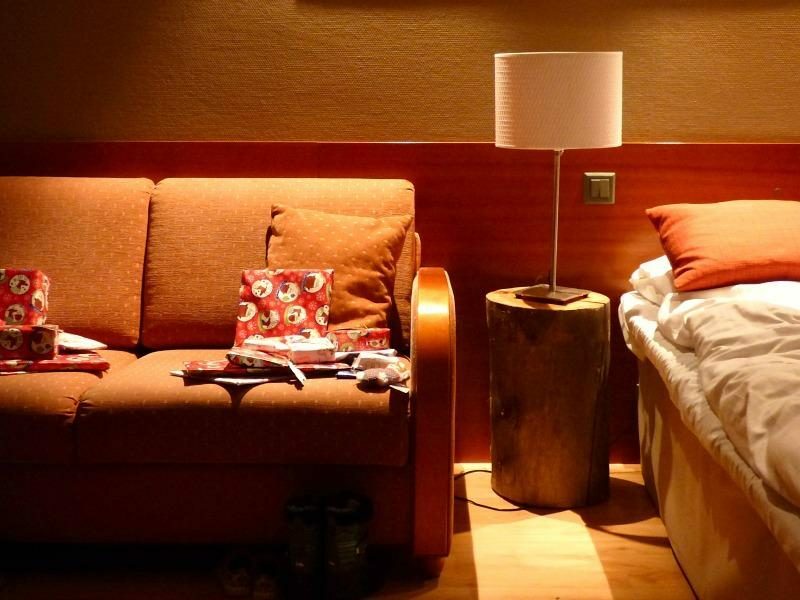 It is perfect for a family and the two boys could sleep in one room in the evening whilst we could have the lights on and enjoy the rest of the evening in our own room. 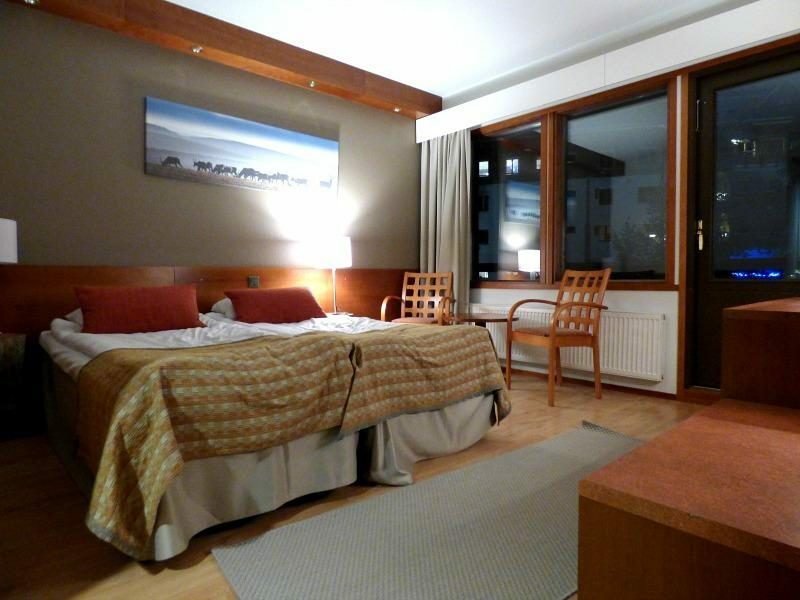 Each of the rooms has a balcony (typically covered in snow, so perfect for playing on whilst waiting for parents to get ready in the morning), beds (we had two singles in one room and a double in the other), desk, sofa/chairs, ensuite and one room had a sauna. Unfortunately we didn’t get a chance to use the sauna as our boys are a bit too small and we were just too busy with everything else. Once the boys were asleep the first night I laid a few small Christmas gifts ready on the sofa in our room for them to wake up to. 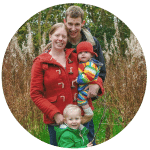 We couldn’t have Christmas without presents and they were ecstatic at all the small gifts they received, from foam santa sleighs to Lego and pocket money toys. Perfect to keep them busy whilst in the hotel room. 3 Will I miss Christmas Dinner? 4 What Else Can We Do in Saariselka? Whilst in Lapland you are each issued with a thermal suit, socks, gloves and snow boots, and although it can be quite cumbersome getting them on and off they are amazingly toasty! Quick tip, if you stay at the far end of the hotel tie the arms of the suit around your waist or you will melt walking through the warm hotel, they are VERY cosy. The temperatures were fairly mild only between -3 to -8, so my initial thoughts on layering under the thermal suits would be too much. I eventually found a good compromise of a thermal top and long sleeve top, plus a pair of thermal trousers to be plenty under my thermal suit. If the temperatures were a lot colder then you would clearly need more layers and we always carried extras in our rucksack. As our boys are still young we made sure they were dressed a bit more warmly for the weather, wearing thermals (these ones), microfleece trousers and tops from Tiny Trolls of Norway (the purple hat below is also a Tiny Trolls one) and another warm jumper on top (such as littlest’s Polarn O. Pyret fleece). We also had our own woolly thermal socks from Heat Holders, which we wore when our other ones got wet. We each had hats (although the boys got the most attention, they’re from Wet Wednesday’s) too, although I took mine off frequently as I got too hot when walking around. 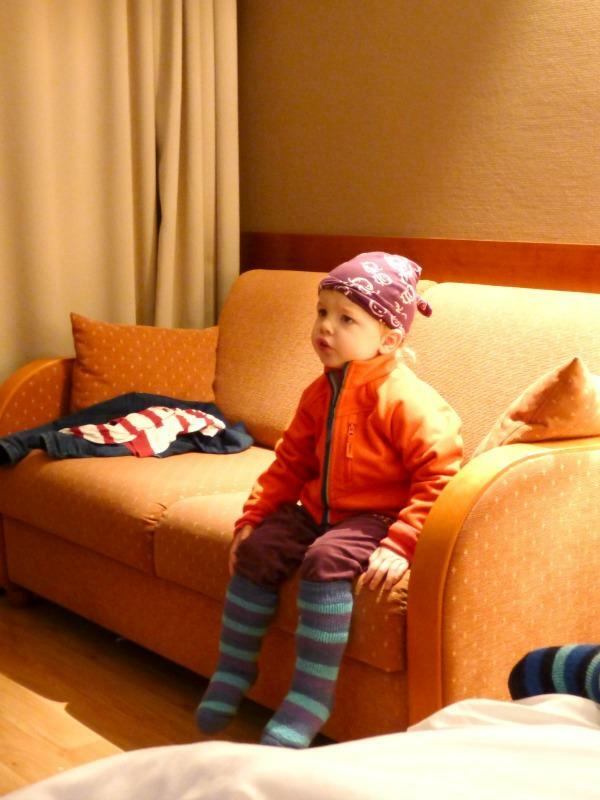 A last little tip for clothing, everyone looks the same in the matching thermal suits so make sure the kids have an exciting hat so you can find them easily. We were taken from our hotel in Saariselka, north to an area of woodland where we could participate in arctic activities for the entire day. In case you may not realise, in December there is only around 3 hours of light in this part of the world, so although many of my photos are shot in darkness, they could still only be at 2pm in the afternoon. 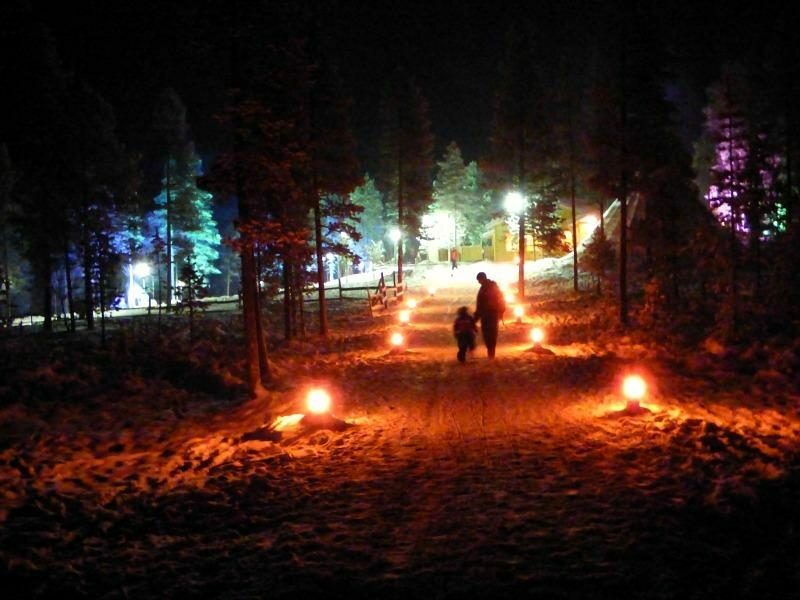 This does just add to the excitement of being in Lapland, especially when the forest is lit up with candle light and beautifully lit igloos. 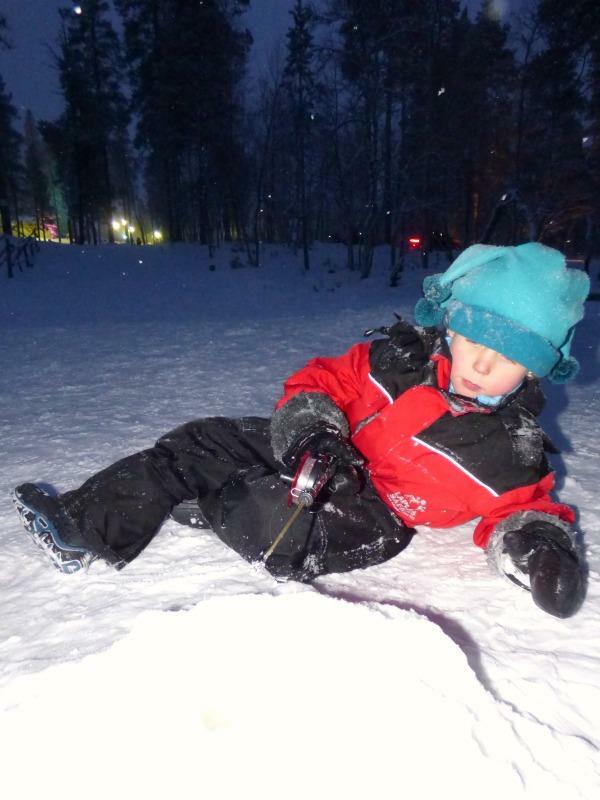 The main activities of our Christmas day were all part of our search for Santa, we went on a reindeer ride, which was a leisurely ride around a quiet area of forest being pulled behind the reindeer in a sleigh. This was in complete contrast the fast pace of the ‘snow train’ a sledge with seats pulled behind a snowmobile (quite possibly our 5 years old’s favourite activity!) and then onto the husky ride, which has to be mine and my husband’s favourite activity. The husky ride involved being taught how to drive the sled, so one adult could drive whilst the other sat inside the sled with the kids, and the 5 husky dogs pulled us through the snow. The first time we tried this our 2 year old fell asleep on me in the sled (he can sleep anywhere, even on fast and bumpy sled rides! ), so I didn’t get a chance to drive and was rather disappointed. Fortunately, we had booked to go on a longer husky ride the following day and I made sure I was the one to drive the sled first and with the exhilaration of being in charge of your own set of huskies (and the tiredness of running up hills with them, *tip* don’t wear too many layers when driving a dog sled!) it was definitely worth it. On Christmas day we also had our own private sled ride to have a private meeting with Santa himself, the boys were amazed to see that he was holding their letters that they had sent him the week before, including the glittery pictures they had drawn him. It was a lovely cosy meeting and the boys were very happy on our ride back, telling us everything that Santa had said to them. 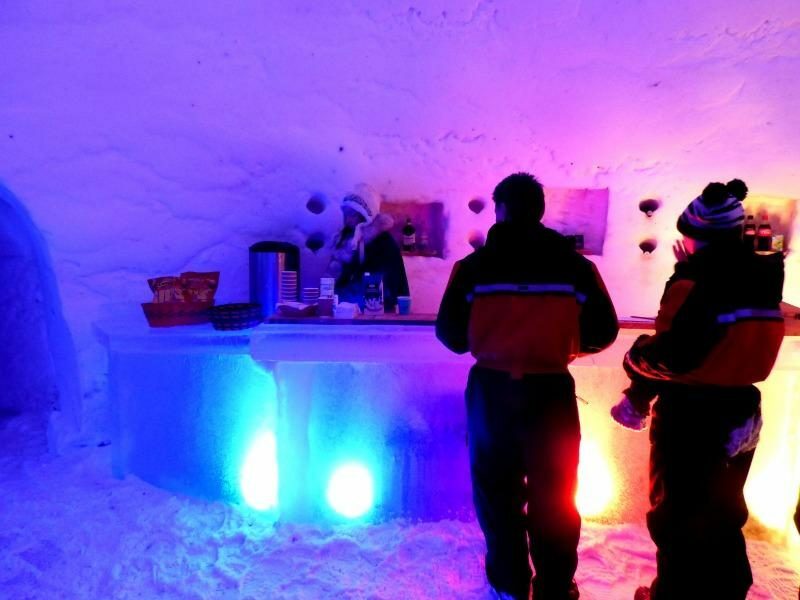 Although it was mild by Lapland standards, it is still cold enough to feel chilly if you are standing still for too long, but fortunately Santa’s Lapland are well prepared for that and there are several Kotas where you can get warm pancakes and warm berry juice. You can also head into the restaurant for a delicious lunch or the room beside to just warm up a little and have a gingerbread biscuit or cup of tea. A little tip for when you go into the restaurant for lunch, there is a room where you can leave your snowsuit in (opposite the toilets) and it makes it so much easier to take it off whilst you eat. 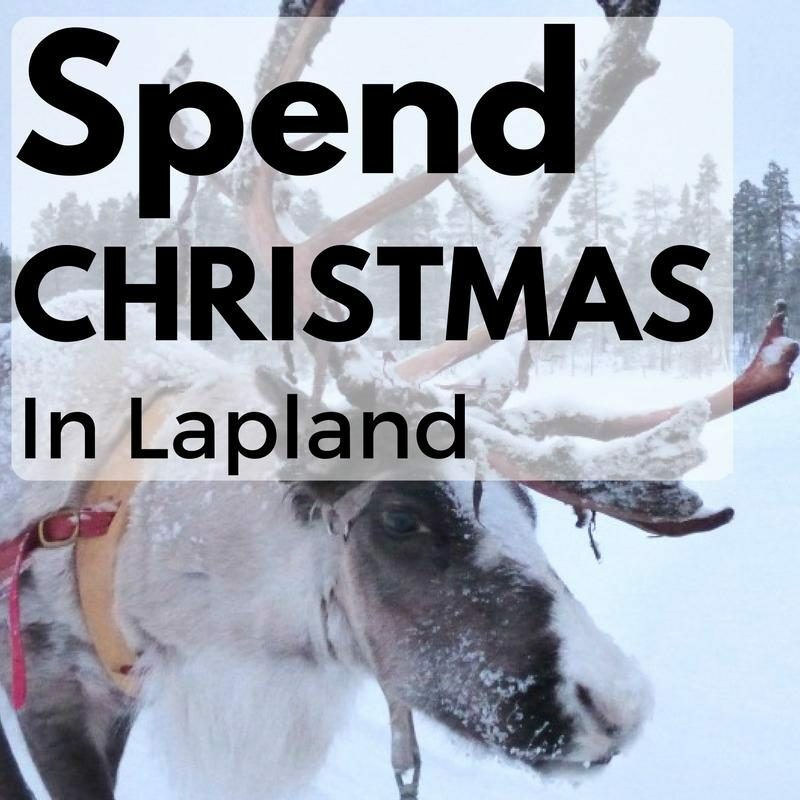 There are also so many other exciting activities to enjoy with Santa’s Lapland including their magical looking igloos and ice bar, ice fishing, ice hockey, mini skidoos, the reindeer centre and of course several toboggan areas too. 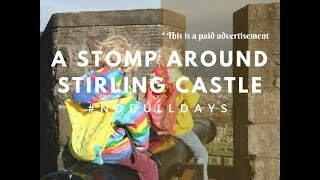 It was an amazing way to spend Christmas day and the kids loved the excitement of everything, although be aware there is some waiting around for different activities so make sure you keep the kids moving and warm even if you’re waiting in a short queue. Will I miss Christmas Dinner? On Christmas day, with Santa’s Lapland, we were treated to a big buffet style meal, with huge choices of meat, fish and veggie dishes. Of course there were also several choices of dessert and crackers too. The boys didn’t seem to care that it wasn’t our traditional dinner or Christmas pudding, it’s easy enough to cook that when you’re home anyway. What Else Can We Do in Saariselka? We were in Lapland for two half days and two full days (Christmas day and Boxing day) and although Christmas day was very busy and we had booked extra activities for Boxing day, there was still plenty of time to participate in one of the best things about Saariselka, their toboggan (sledge) run. It’s the longest toboggan run in Europe and although we didn’t get to the very top, we still went quite high up the slope and the kids loved it. The earlier you go the quieter the slopes will be and there will be less chance of crashing into other people (which, yes, did happen). There are toboggans outside lots of the hotels so you can tow the kids down to the toboggan run (just make sure you bring a toboggan back with you for others to use). With little ones go down the slope on the sledge together and try and show your older kids how to steer the sledge away from danger (i.e. 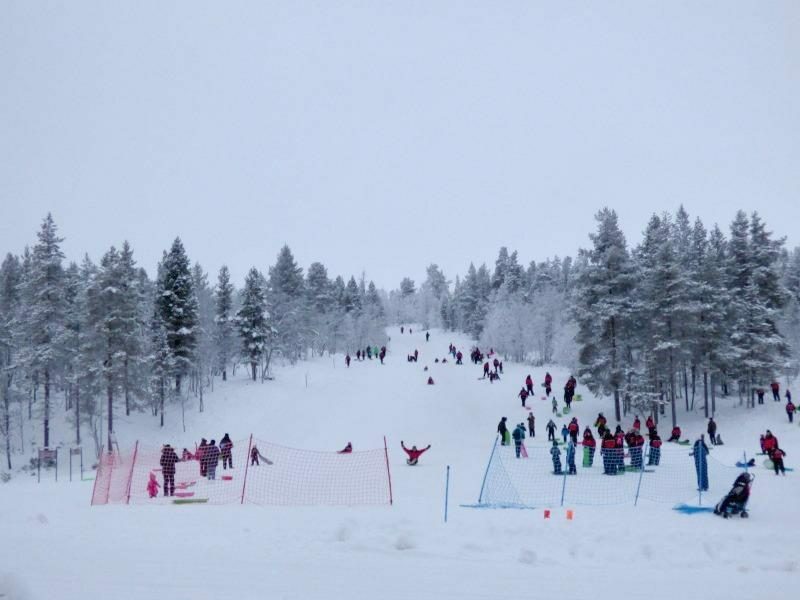 people going up the slope or trees at the side), using hands on the snow or leaning. Our 5 year old did manage some epic crashes into the trees and through some sledges going back up the hill, so when it was busy we went down together. 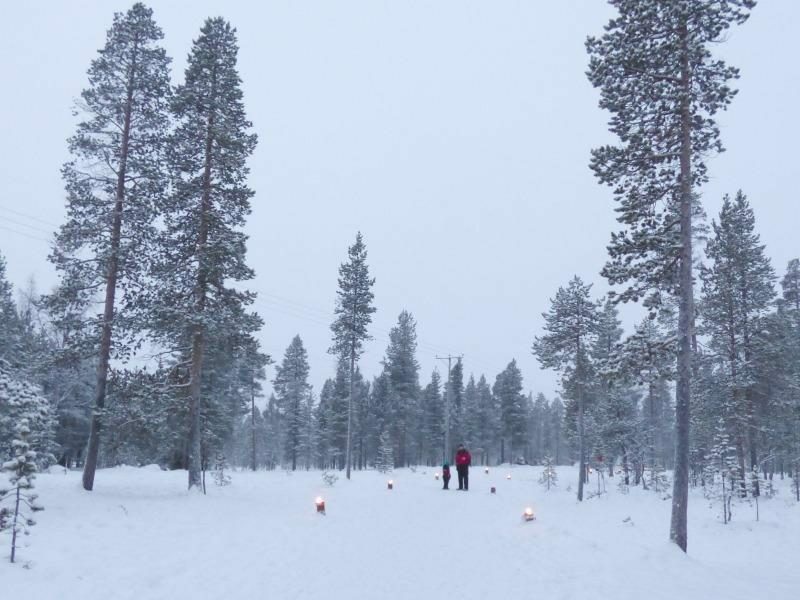 Aside the fun of sledging there is also the possibility of seeing the Northern Lights whilst in Saariselka, which we were really keen to see. 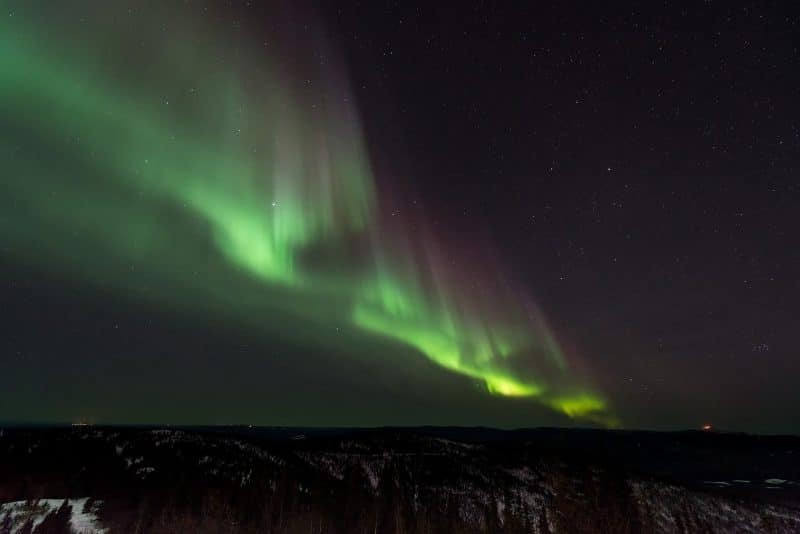 You can go out on a Northern Lights adventure tour that takes you out into the wilderness of Lapland on a snowmobile, where you can look for the lights in the darkness of the countryside. However, even if you can’t manage to get out into the wilderness there is a lovely short walk you can take through the forest behind Saariselka, the ‘Aurora walk’, where you only need to walk a kilometre or so to a specially built building with a huge balcony to stand in the dark and look for the aurora borealis. Unfortunately it was cloudy every day we were in Lapland, so we didn’t see the aurora, but the night before we arrived there was an amazing display! We will definitely have to go back another time to see the Northern Lights for ourselves. 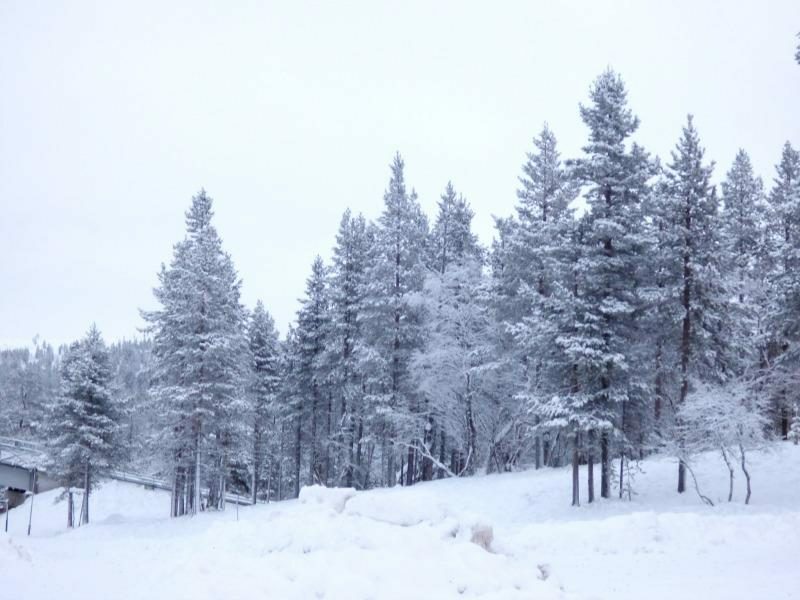 Book your own Lapland holiday with Santa’s Lapland here and experience an amazing white Christmas with Santa himself. 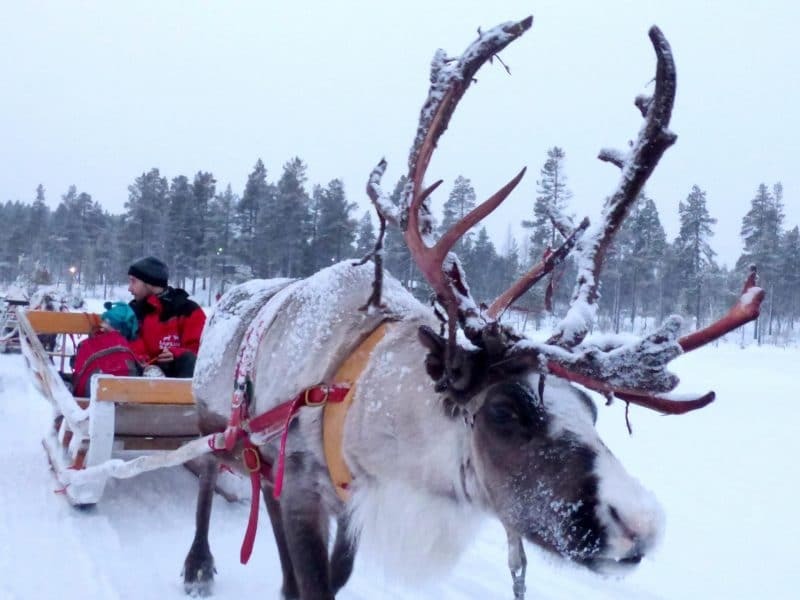 *We received the Santa’s Lapland package for the purpose of this post, however all opinions are our own. Sorry if I offended – my comment was genuinely not intended to poke fun. As I intimated I’m VERY green at how blogging works & contemplating exploring/trying to learn more. 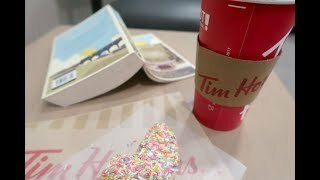 Although trips to Lapland are prob on the rare side of the work done it doesn’t always seem that the value of the product reviewed equates hence the ‘free stuff’ comment. We were on the same flight as you so surprised you didn’t mention the delays. I’ve travelled a lot but ‘we’ve got a fault so will be trying turning the plane off then on again’ was a first! I’d avoid Small Planet. I’ve heard EasyJet organise singing rather than leaving it to individual kids. We’d recommend the trip too, but not at Christmas due to the huge queues for the activities on Christmas Day meaning we didn’t get to try everything. Plus we were one of the families left out in the cold and dark, for nearly an hour, at the end of the day when the messed up the coaches. I’ve put my review on TripAdvisor (Holiday Club) as I don’t blog and haven’t received any freebies. Hi Venna, The delays weren’t the fault of Santa’s Lapland, as annoying as they were. It was high wind in Glasgow when we left, although the switching the plane off and on was a first for us too. We didn’t find the queues too bad, aside the one to see Santa, but then other activities were provided whilst one parent waited in the line. This may be because we were on the last bus to arrive that day, so others had already been using activities for over an hour and a half. Small Planet gave a reputation for delays and Santa’s Lapland choice to use them. Plus our delay was only due to weather for 1hr 20 mins so rest was down to the airline, chosen by the operator. The rest was airline. Luckily Manchester flights are via EasyJet as believe so gave advised friends to try and book these. Your right the queues were due to weight of numbers in Christmas Day. It sounds like you were in a Kieran coach too do everyone was there by the time we started. Was on the same trip and left a comment but it seems to have disappeared. It was fair and recommended the trip despite mentioning issues you didn’t cover. Where’s it gone? My mistake. Didn’t understand Huw it worked & thought I’d seen it go up, sorry. Oh Jenny this just looks so magical! I’m glad you had such an amazing time and I do hope to be able to do it with my girls some time in the future. It’s a shame you didn’t see the aurora but all the things you did and saw definitely made up for it. I didn’t realise there were so many activities, I suppose I naively thought it would be all about a visit to Santa and not much else. The other things you got to do would definitely make me want to go even more! What an amazing trip this must have been! 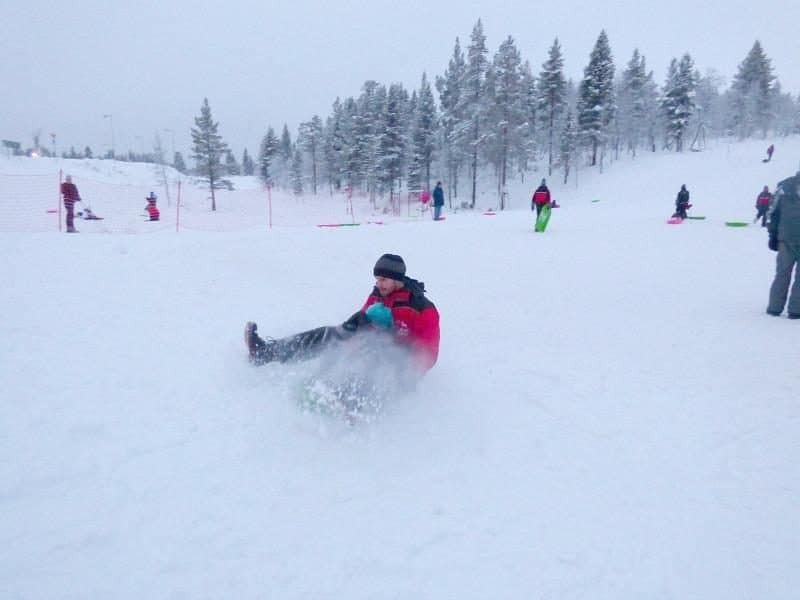 I’ve been a few times to Lapland, but always skiing so I never managed to do many other activities. 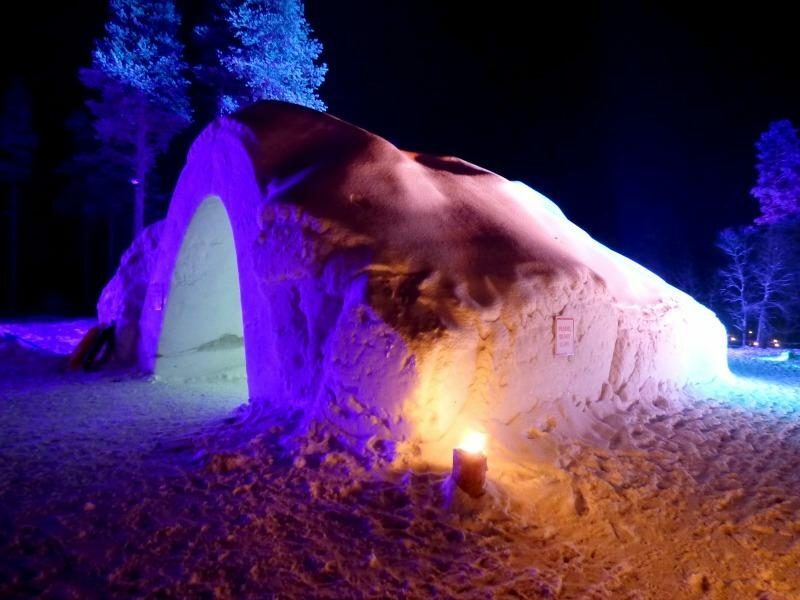 This looks amazing though and you really got to experience Lapland! 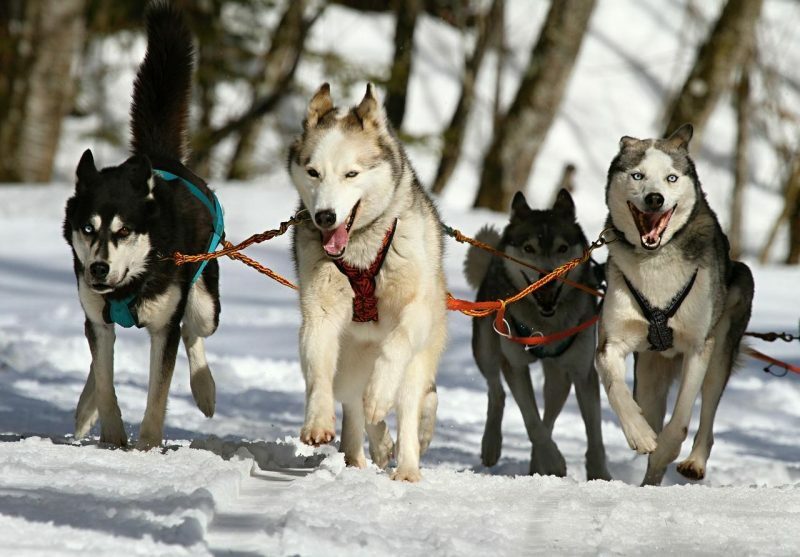 A husky ride sounds brilliant! This sounds so amazing! 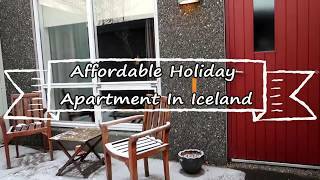 As an American with a very long plane flight there, I wouldn’t have thought of going to Iceland for Christmas, but now I’m reconsidering. Iceland / Copehagen / Sweden is actually the first international trip I hope to bring my kids on! Wow! It looks like you had an amazing time! 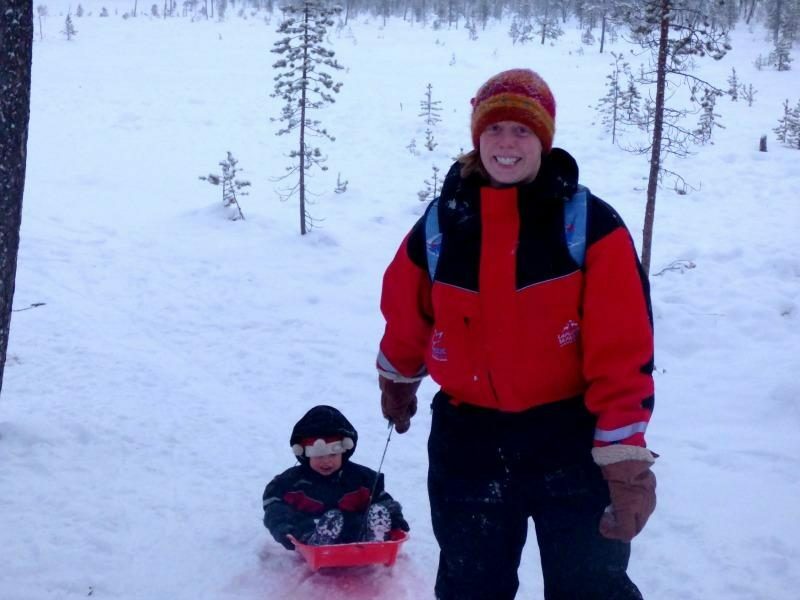 I’d love to go to Lapland for Christmas, although I think it would benefit the little one more once he is older! It looks and sound so magical! I’ll have to start saving! I love the fact that your son fell asleep on the sled! This looks amazing – probably the sort of Christmas a family will look back on as being the best ever. OMG we are doing this this year! Will be obsessively reading all your posts, I am SOOO excited! Thank you. I can’t wait ?